Walking in a winter wonderland is great, but how would you like to fly instead? Just enter your information and you could win 250,000 AAdvantage miles toward your next flight from the AAdvantage eShopping mall! We’ll also be giving away instant prizes of 5,000 AAdvantage miles and $100 eGift cards to top merchants so come back daily for your chance to win! It’s easy to enter, all you have to do is visit merrymilessweepstakes.com, submit your entry, then click a button to see if you win an instant prize. After you play, visit the AAdvantage eShopping Mall to earn another entry. You can play once each day from now through December 31, 2013. Go here to read the rules and visit merrymilessweepstakes.com to enter. Today is the last day to enter The Flight Deal T-Shirt Giveaway. Go here for a chance to win a cool looking TFD t-shirt! Foodie, traveler, and fellow AA enthusiast Justin of Justin Does Blog is giving away a free Admirals Club Day Pass to three lucky readers! Go here to leave a comment and to enter. Congratulations! 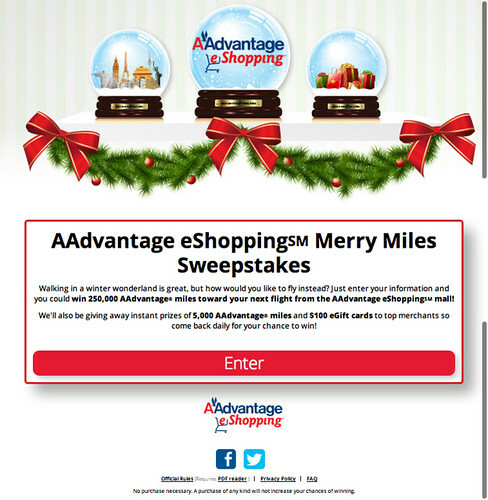 We’re happy to let you know that you are a potential winner in the AAdvantage eShoppingSM Merry Miles Instant Win Game! You’ve won 5,000 American Airlines AAdvantage® miles, which will be credited to your AAdvantage® account after you provide us with your AAdvantage number. @ JINPEI – That’s awesome!! Congratulations and thanks for sharing the good news! !